Assess how you currently use influence behaviors and identify areas for development. Demonstrate influence by expressing yourself clearly. Apply listening and asking questions, rather than position and status, to influence others. Establish clear goals for how you want to “show up” during influence situations. Apply influence skills to a real-life influence opportunity. Below is the influence model for Personal Leadership and Influence. 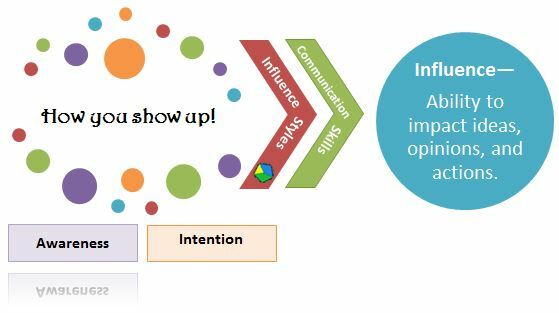 This model depicts that our ability to influence is driven by how we show up. How we show up is determined by the influence style and the communication skills we choose to demonstrate. How we show up is predetermined by the awareness we have of ourselves and others. Our intention, stated or unstated, also impacts how we show up. Below is a table that depicts the topics, timing, and elapsed timing for the course.